To be called ‘dark chocolate’, chocolate has to contain a higher percentage of pure cocoa. It contains no milk solids, only cocoa liquor, cocoa butter, sugar, vanilla and lecithin. 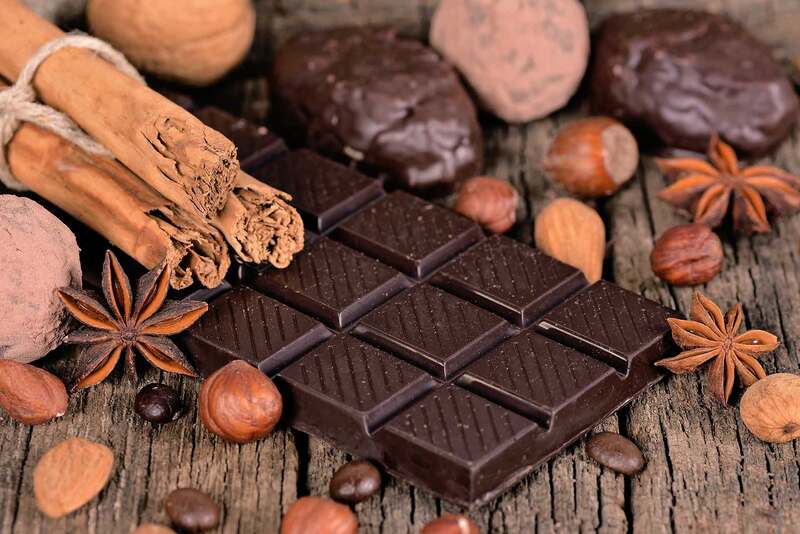 According to some regulations, chocolate must contain at least 34% cocoa solids to qualify as dark chocolate, although generally the percentage of cocoa liquor is around the 60% level. Some dark chocolates have a pure cocoa content of 75%, 85% or even 95%. Dark chocolate is often the connoisseur’s chocolate of choice. Some people find the taste of dark chocolate bitter, although the bittersweet taste can vary from company to company depending on how much sugar is added. Milk chocolate, as the name implies, contains milk solids. The dairy products make the chocolate creamier, lighter, and easier to melt in the mouth. Some regulations require a 10% minimum of cocoa liquor and 12% milk solids. High quality milk chocolate contains less sugar and uses expensive cocoa butter. Lower quality milk chocolate often uses more sugar and substitutes cheaper vegetable oils for cocoa butter. The criteria for white chocolate is that it must contain 20% cocoa butter, 14% milk solids and no more than 55% sugar. The total absence of cocoa liquor accounts for its white appearance. Although some will argue that white chocolate is not really chocolate, due to the absence of cocoa solids, it is true to say it is a chocolate derivative as it is created from a combination of milk solids and cocoa butter. “One day, Chef Frederic Bau, from L’Ecole du Grand Chocolat, forgot some white chocolate in a bain-marie to melt. Ten hours later, he was drawn by the delicious aroma that reminded him of roasted Breton shortbread: the white chocolate has turned blonde, a colour never seen in chocolate before, wafting a new aroma, reminiscent of caramelised milk. With its delicately sweet taste that marries intense biscuit flavours with a pinch of salt, a creamy texture, hints of caramelised milk, and unique blonde color, Dulcey offers chefs and chocolatiers brand new tools to continue to push their creative boundaries and please customers. Baking chocolate is not meant to be eaten as it is. It is made with pure cocoa liquor and has a bitter taste. It is designed for use in cooking when it is combined with sugar to make it more palatable. Composed solely of ground cocoa beans and cocoa butter, baking chocolate contributes a deep, rich, chocolate flavour to patisseries.